When Galileo began to experiment with his new telescope, by pointing it to the sky, he made the world's first astronomical observations. His first area of study was the Moon. 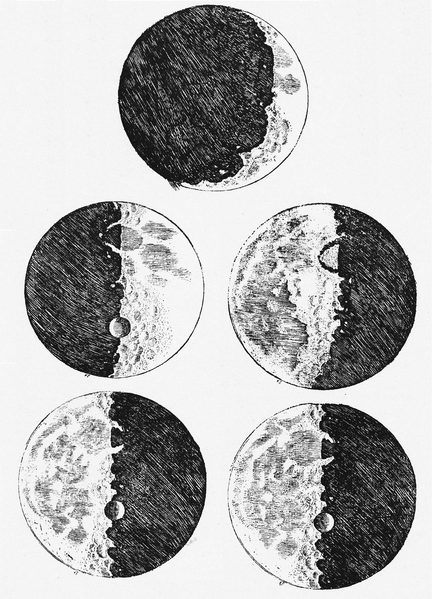 Stunned to see that the Moon is not smooth - it appeared rough and earth-like to him - Galileo continued his observations through a series of lunar phases. He sketched the Moon like the Earth. Next, Galileo wanted to observe the planets. The closest one, at the time, was Jupiter. While focusing his new device on Jupiter, Galileo saw what appeared to be three "fixed stars" by the planet. Viewing this remarkable configuration over succeeding nights, Galileo saw that the "stars" were still there, but their positions - relative to Jupiter - had changed. He concluded that the bodies must be moons, not stars, revolving around Jupiter. In slightly more than a week, Galileo had made an astonishing discovery. He rushed to print his findings and conclusions, so other people - using his telescopes - would not publish similar findings before he did. By March, of 1610, he was able to tell the world - in a book called The Starry Messenger (Sidereus Nuncius) - what he had seen just two months earlier (between January 7-14, 1610). As Galileo's fame spread, so did his reputation for arrogance. Not one of his best characteristics, Galileo's pride angered other scholars. Although he was the first to actually see that Ptolemy was wrong (when he said that an unmoving Earth was at the center of the universe), Galileo's conclusions actually came sixty years after Copernicus had reasoned (without the benefit of a telescope) that the Sun was at the center of the universe. And ... although Copernicus said the Earth was spinning on its axis once each day, no one had observational evidence that the Earth moved. People thought Copernicus was crazy. "Look at the ground," they would say. "It isn't moving!" Galileo read Copernicus and believed him. But ... how could he prove the Earth moves around the Sun? Galileo wanted to devote all his time to research, instead of also teaching at the University of Padua. To make that happen, Galileo thought he should work in Tuscany - the area of his birth - where he could potentially be sponsored by Duke Cosimo de Medici. Only with more time could he develop proof that Copernicus was right. Thrilled when the Medici court extended his sought-after invitation, Galileo did not envision the risks which his new appointment presented. Leaving the University of Padua also removed him from the protection of the Republic of Venice (and the intellectual and academic freedom he had previously enjoyed). Galileo would soon be on a collision course with the Catholic Church and its infamous Inquistor. Clip from "Galileo's Battle for the Heavens," a NOVA Production by Green Umbrella, LTD for WGBH/Boston (in association with Channel 4). Copyright 2002 - WGBH Educational Foundation, all rights reserved. Clip provided here for educational purposes and to acquaint new viewers with the 2002 production. Online, courtesy NOVA and YouTube. Manuscript, imaged above, online via NASA; maintained by the University of Michigan Special Collections Library. Translation of Galileo’s notes regarding Jupiter’s moons online via NASA. 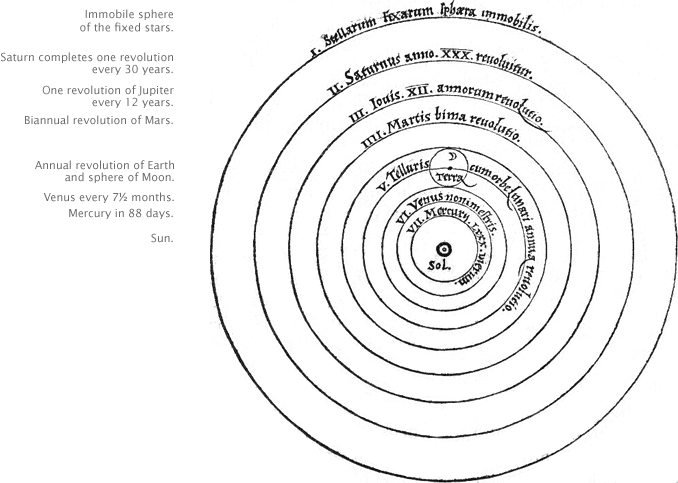 Depiction of Copernicus’ theory, online via NASA. The top half of the imaged manuscript is the draft of a letter Galileo wrote to the Doge of Venice (Leonardo Donato) in August of 1609 (soon after he greatly improved a new invention called the “telescope”). 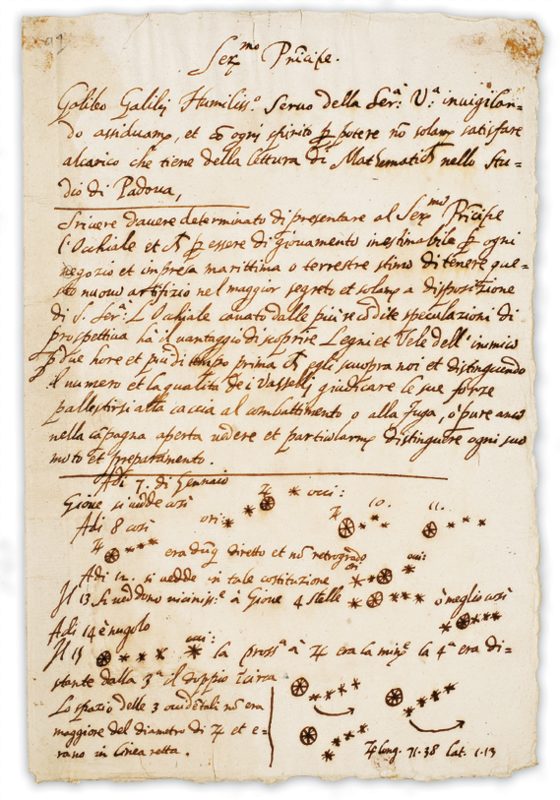 The lower half of the document reflects Galileo’s observations of objects near the planet Jupiter. At first Galileo thought those objects were stars but realized they had to be moons circling the planet when he observed them in different positions on successive nights during January of 1610. Galileo Galilei most humbly prostrates himself before Your Highness, watching carefully, and with all spirit of willingness, not only to satisfy what concerns the reading of mathematics in the study of Padua, but to write of having decided to present to Your Highness a telescope that will be a great help in maritime and land enterprises. I assure you I shall keep this new invention a great secret and show it only to Your Highness. The telescope was made for the most accurate study of distances. This telescope has the advantage of discovering the ships of the enemy two hours before they can be seen with the natural vision and to distinguish the number and quality of the ships and to judge their strength and be ready to chase them, to fight them, or to flee from them; or, in the open country to see all details and to distinguish every movement and preparation." Bos, Carole "Galileo - Telescopic Finds and Starry Messenger" AwesomeStories.com. Apr 14, 2013. Apr 24, 2019.